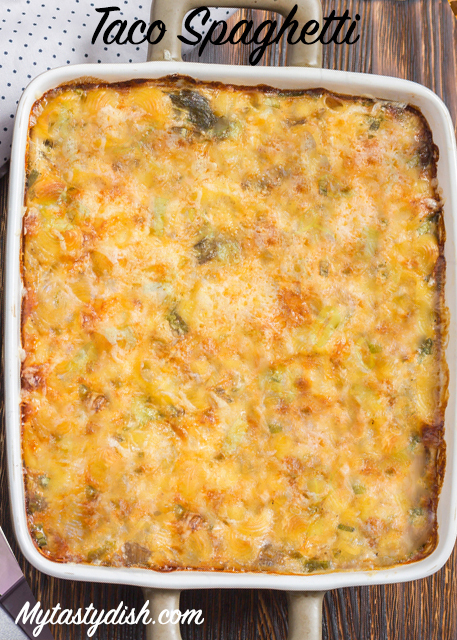 An easy prep casserole that cooks in one pot before it is baked. 1. Brown ground beef in a Dutch oven. Drain fat and return to pan. 2. Stir in taco seasoning. 3. Add Rotel, tomato paste and spaghetti. 4. Cover with 6 cups of water. 5. Bring to a boil and then reduce the heat to simmer. Cover and cook until pasta is cooked and water is absorbed, approximately 15 minutes. 6. Pour spaghetti into a sprayed 13×9 casserole dish. 7. Top with the shredded cheese and bake at 350 until the cheese is melted and bubbly. 8. You can also cook this completely on the stove top, just add the cheese after step 3 and cover & simmer until cheese is melted. I prefer the cheese to be melted in the oven until golden and bubbly. Serve with sour cream and cilantro (both optional).